You can go shopping for software, programs, and apps for your Galaxy Tab at the Android Market. You can browse, you can get free apps or books, or you can pay. Officially, the Android Market is called the Market and the name of the app is Market. 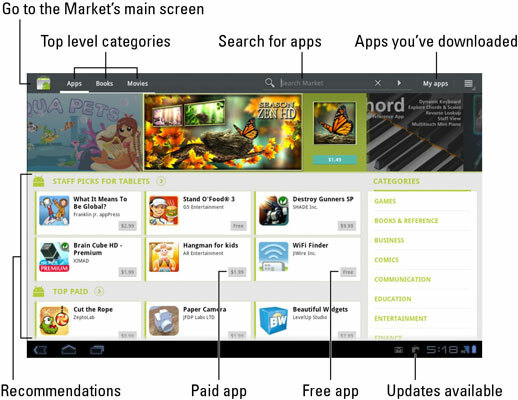 You access the Android Market by opening the Market app, found on the Apps Menu screen but also on the main Home screen. After opening the Market app, you see the main screen. You can browse for apps, games, books, or movie rentals. The categories are listed on the top-left part of the screen, with the other parts of the screen highlighting popular or recommended items. Those recommendations are color-coded to let you know what they are: green for apps, blue for books, and red for video rentals. Find items by choosing a category from the top of the screen. The next screen lists popular and featured items plus categories you can browse by swiping the screen right to left. The category titles appear toward the top of the screen. When you have an idea of what you want, such as an app’s name or even what it does, searching works fastest: Touch the Search Market button at the top of the Market screen. Type all or part of the app’s name, the book or movie title, or perhaps a description. Touch the keyboard’s Search or Go button to begin your search. To see more information about an item, touch it. Touching something doesn’t buy it but instead displays a more detailed description, screen shots, a video preview, comments, plus links to similar items. Return to the main Android Market screen at any time by touching the Market icon in the upper-left corner of the screen. You can be assured that all apps that appear in the Android Market can be used with the Galaxy Tab. There’s no way to download or buy something that’s incompatible with your Tab. All apps you download can be found on the Apps Menu screen. Further, apps you download have shortcut icons placed on the Home screen. You obtain items from the Market by downloading them into your Tab. That file transfer works best at top speeds. The Market app is frequently updated, so its look may change from what you see here. They may also add a Music category in the near future. Pay attention to an app’s ratings. Ratings are added by people who use the apps — people like you and me. Having more stars is better. You can see additional information, including individual user reviews, by choosing the app. Another good indicator of an app’s success is how many times it’s been downloaded. Some apps have been downloaded over ten million times. That’s a good sign. Apps you download are added to the Apps Menu, made available like any other app on your Tab. They also appear as Home screen shortcut icons. In addition to getting apps, you can download widgets for the Home screen as well as wallpapers for the Galaxy Tab. Just search the Market for widget or live wallpaper. Books and videos you get from the Market are viewed using the Books and Videos apps, respectively.